Now that looks delicious & very summery Have a strawberrytastic week ;-)PS. Guess who I spotted on the Primark site I thought I recognise that face heheh! Thanks Steve :)Hehe, I like to hop around a lot.. Thanks Sara, I'm trying to be healthier, shame I fail today 🙂 back on it tomorrow .. I just love strawberries. That looks so tasty! I want one of those please! Mm that looks tasty! 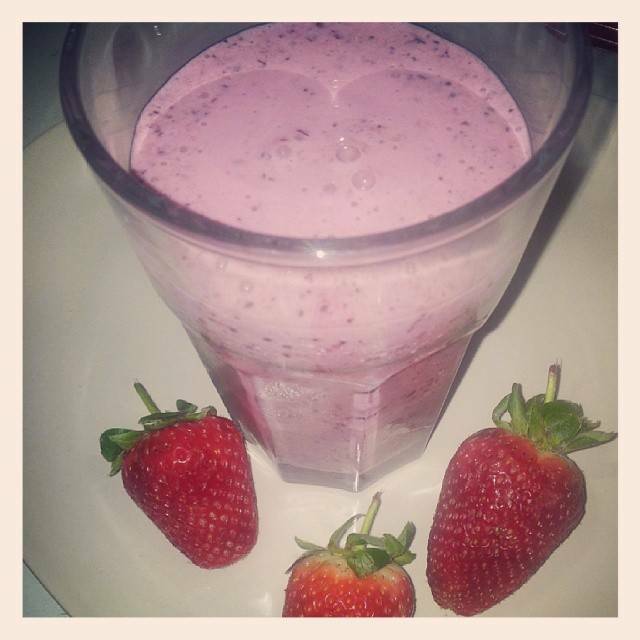 I haven't made a berry smoothie in ages – usually I do banana and peanut butter. Hi Claire, can I have a sip of the strawberry smoothie? It looks so good! Have a great day and week!